Bill and Becky Brown met at a Christian conference when Becky was 14 and Bill was 16. A few years later, they were married. 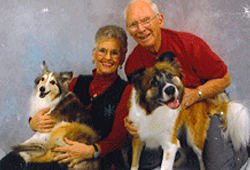 This past fall, Bill and Becky celebrated their 61st wedding anniversary. Together they raised four wonderful children and started three Christian book stores. When they retired, Becky didn't think they could give as much to the Lord because their income decreased. However, that hasn't been the case. Becky said the Lord has blessed them in amazing ways and they are trying to give away $100,000 through Charitable Gift Annuities (CGA). As the money comes in, they give it away. Understand, Bill and Becky do not consider themselves wealthy. Becky: We just keep enough to pay the bills and the rest goes to the Lord's work. You see, a Charitable Gift Annuity allows Bill and Becky to give without worrying about the future. They have more than 12 gift annuities with different ministries and colleges including one with Family Research Council. They invested in a Charitable Gift Annuity with Family Research Council because they want to protect Judeo-Christian values for future generations. Bill and Becky: We're givin' while we're livin' so we can be a knowin' where it's goin'.